How does cuddling up beside a crackling fire in a lodge tucked away in the Canadian Rockies after a day of cross-country skiing sound? Nice, right? There are tons of active travel opportunities in Alberta and British Columbia where you can do exactly this and more. Today’s guest writer, Leigh McAdam from HikeBikeTravel, lets us in on to best way to enjoy this incredibly scenic area. Nothing beats warming up in front of a roaring fire after a long day of cross-country skiing. Of course, first you have to decide where you’d like to rest your weary legs after various ski jaunts through the snow-covered mountains. Would you like to drive or ski into a backcountry lodge? Those with deep pockets can also choose a lodge accessed via a helicopter – and from there you can do guided tours. Cabin at Assiniboine Lodge. In the winter, you have to be flown in by helicopter! Driving is definitely the easier option – and it allows you to explore a wider network of trails. Getting to a lodge is rarely an issue – unless the roads are terrible and that in reality doesn’t happen very often. Skiing to a backcountry lodge located 6 – 10 miles in from the road can be a lot of fun, but many people aren’t comfortable with route finding. 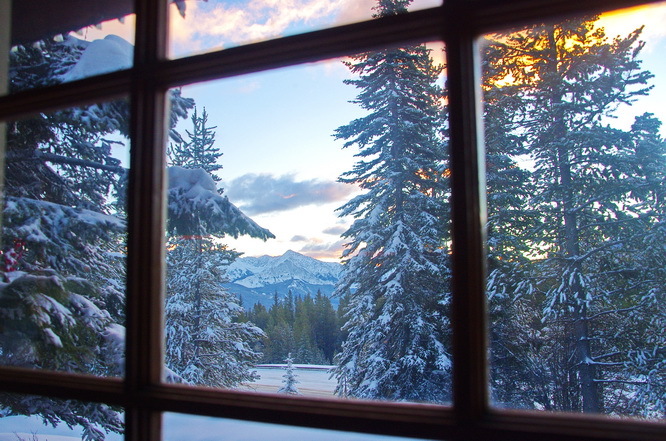 Incredible views from Mt Engadine Lodge. Two lodges, accessed by car, both in what feels like the middle of nowhere, guarantee a snowy experience. Mt. 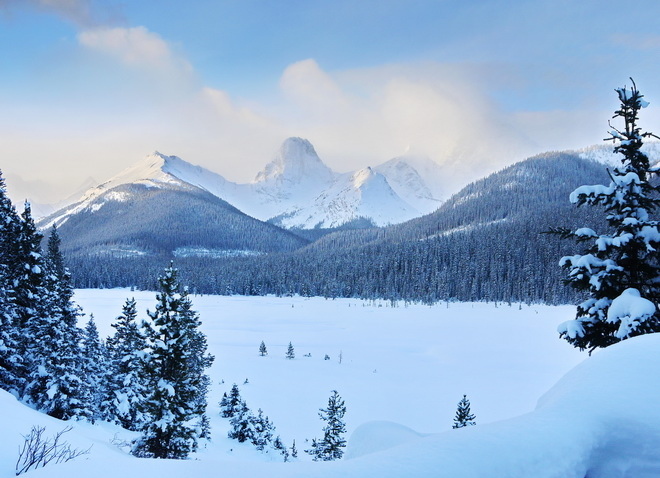 Engadine Lodge in Kananaskis Country (near Banff National Park) delivers monster amounts of snow so skiing to nearby Chester Lake and/or Mt. Shark are picturesque options. Snowshoeing is another possibility but the lodge is a particularly nice place to relax especially with spectacular mountain views from every room. 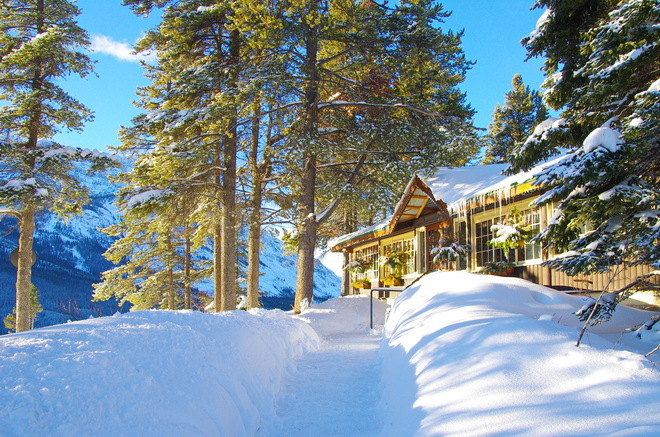 It’s an all-inclusive lodge so any calories you burned skiing will likely be eaten over the course of their three delicious meals and poorly named mid-afternoon tea that’s actually more lunch than tea. Skiing Chickadee Valley in Kootenay National Park. 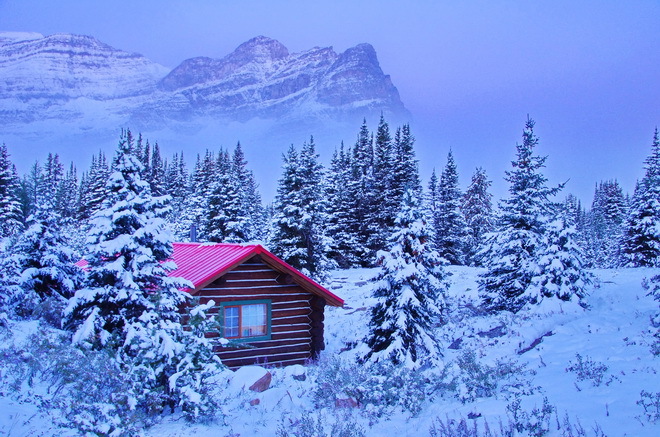 Storm Mountain Lodge, located near the border of Banff and Kootenay National Park, delivers the full historic log cabin experience, complete with your own wood burning fireplace. 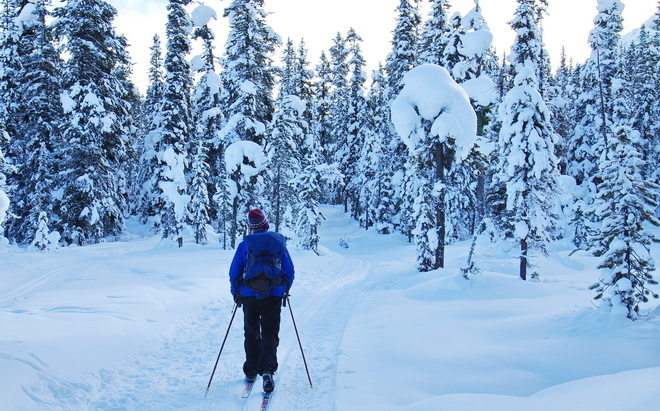 Superb cross-country skiing is just five minutes away in an area noted for its vast amounts of fluffy, white snow. Two trails in particular are worthwhile. Both are six miles as a return trip and take three to four hours, leaving you with plenty of time for R&R. Skiing to Boom Lake is on a marked trail whereas the trail up Chickadee Valley is unmarked though well-used. It’s one of the prettiest trails I’ve ever skied. Walking up to the main lodge at Skiing Chickadee Valley in Kootenay National Park. Storm Mountain Lodge is roughly equidistant between Banff and Lake Louise, so both are good destinations for day trips. 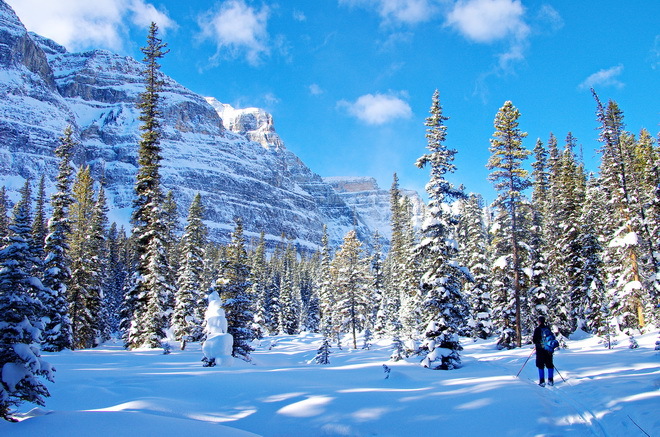 Snow is usually better in the Lake Louise area so if it’s skiing you’re after, head here. Any of the trails in the Pipestone area, just minutes from the village of Lake Louise are first-class. But there are several near the Fairmont Chateau Lake Louise that deliver the quintessential Lake Louise views. For an easy outing, ski to the far end of Lake Louise. For something more rigorous, ski the Fairview and Tramline Trails. And if you’re a competent skier who likes to be challenged, ski to Paradise Valley, but don’t forget the avalanche gear. One of the many beautiful cabins in the area. If you don’t want to leave Storm Mountain Lodge, you can snowshoe right outside your cabin on a couple of miles of trails that have been cut into the woods. This lodge is also one where it’s lovely to do nothing. Sit by the fire in the main lodge and chat up your fellow guests or retire to your own private cabin and enjoy the solitude. Of course, there’s nothing wrong with just enjoying the view from the chimney-warmed interior! 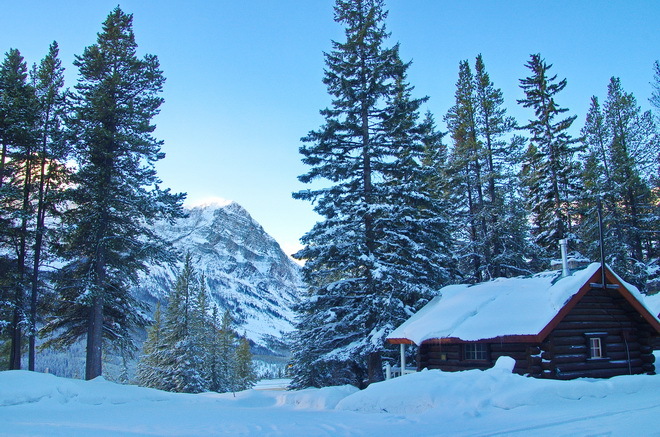 Winter is a glorious time to explore the outdoors, especially when you’re staying in a beautiful lodge in a first-rate mountain setting. Have you visited the Canadian Rockies or are you planning a visit? Come join the conversation at the My Itchy Travel Feet page on Facebook. Or send us an email with your thoughts.